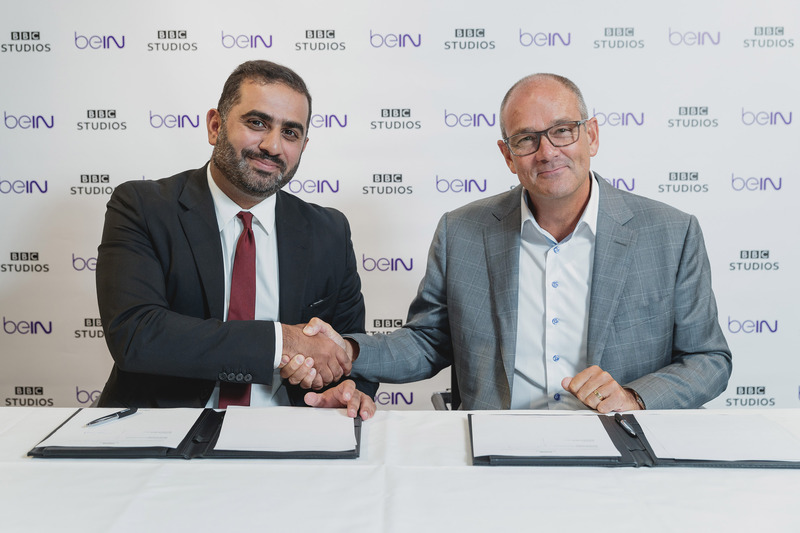 Paul Dempsey, President for Global Markets at BBC Studios, and Yousef Al-Obaidly, Deputy Chief Executive Officer of beIN MEDIA GROUP, placed pen to paper to sign the agreement – which is set to run for an initial three year term from 1 August 2018 – at BBC Studios’ London headquarters in Television Centre. In a symbolic deal for both companies, the partnership continues to extend their creative ties and has been a strategic priority for each organisation. As part of the agreement, BBC Studios and beIN intend to seek opportunities for the development and/or production of content, while exploring the acquisition of additional BBC Studios’ digital content by beIN to complement the current BBC programming on beIN’s platforms. Included in the MOU is the agreement by BBC Studios and beIN to explore investment in content production and for the two companies to collaborate on knowledge exchange and media business development opportunities in the State of Qatar. Earlier this year, beIN launched BBC Earth, BBC Studios’ global factual brand, as a linear channel across the Middle East and North Africa via its direct-to-home service. BBC Earth joined BBC Studios’ pre-school brand, CBeebies, which has been on the beIN platform since 2016. BBC Earth and CBeebies are also available as bespoke channels in Turkey via pay-tv operator Digiturk, which – along with MIRAMAX studios – is also part of beIN MEDIA GROUP’s rapidly-growing and market-leading global and entertainment and sports business.